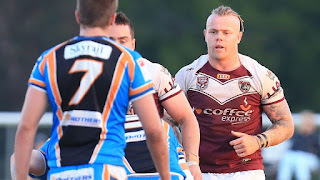 He is one of the in-form forwards of the Intrust Super Cup at the moment, and Burleigh prop and PNG international Luke Page is excited to lead his side against the PNG Hunters this weekend. The 25 year old, who was previously signed with the Canberra Raiders, made his NRL debut with the St George Illawarra Dragons before returning to Burleigh this season. However, this weekend, he will be lining up against fellow PNG team-mates like Timothy Lomai and Brandy Peter who are playing in a Hunters side who defeated the Ipswich Jets last weekend in a tight affair. “I started playing footy at Centenary Panthers at the age of 11 because my older brother played. So that was the main reason for me to start rugby league I played at that club until I was 16,” Page said of his rugby league beginnings. He spent three seasons with the Gold Coast Titans Under 20s side before signing first fulltime NRL contract with the Titans at the young age of 20, before later making the move to Canberra. “In 2014, I started off playing for the Burleigh Bears in the Intrust Super Cup and about eighth rounds in, I got an offer from the Canberra Raiders for the rest of the season and into 2015,” Page said. That year, he was named the Courier Mail Player of the Year for the Intrust Super Cup and represented the Queensland Residents side. Last year, he mainly featured for the Canberra Raiders feeder club Mounties in the than NSW Cup, but then St George Illawarra Dragons offered him a mid-season move. He took the offer and made his NRL debut against North Queensland Cowboys and then spent the remainder of last season with the Illawarra Cutters in the NSW Cup. “The Dragons didn't offer me a contract for 2016, so I made the decision to come back home to the Burleigh Bears. “I think my team-mates help me a lot, and what my coach at Burleigh has brought into the team this year. And coming out of full time NRL has helped me a lot this year. Away from club football, Page has also already played two Tests for PNG, including in this year’s historic win over Fiji in the Pacific Test. “My father was born in Port Moresby and lived there until he was about 21 years old. While the Bears lost to Northern Pride last weekend 25-24, they are leading the competition and Page and his Bears will be looking to become the first team topple the Hunters at home this season. “(I am) 100% excited to play in PNG this week,” Page said. “It will be good to see the boys again, I have been speaking to a few of them on Facebook and we're catching up when I’m over there. When asked about the game he said he would be working on finding a quicker play-the-ball. “If I can speed that up for the team, it'll help us a lot against the Hunters. “(it is) always good to come to PNG to see and hear the atmosphere that the crowd brings.